Religious shrines or art in the public square are relatively rare in the United States but quite common in Europe, South America and other areas that have a predominantly Catholic culture. If all goes as planned, in the not too distant future that will change on the 2200 block of South Broad Street in Philadelphia when a shrine will be prominently displayed by a wall of the Carto Funeral Home, clearly visible from Broad Street. It will be in the form of a shrine with a large bronze image of Our Lady of Guadalupe, the Patroness of the Americas, as she appeared on the tilma (cloak) of St. Juan Diego in 16th century Mexico. When it happens, it will fulfill a dream of Sister Paula Bierschmitt, I.H.M. Sister Paula will not be physically present when her efforts come to fruition, but rest assured, she will be looking down from above. Sister Paula, a gifted artist in her own right and the founder of the American Academy of Sacred Arts in South Philadelphia in 1993, died in September 2013. It all goes back to 2008 when Sister Paula, who was visiting Mount St. Mary’s University in Emmitsburg, Md., snapped a picture of a mosaic of Our Lady of Guadalupe in a prayer garden with her old-fashioned box camera. 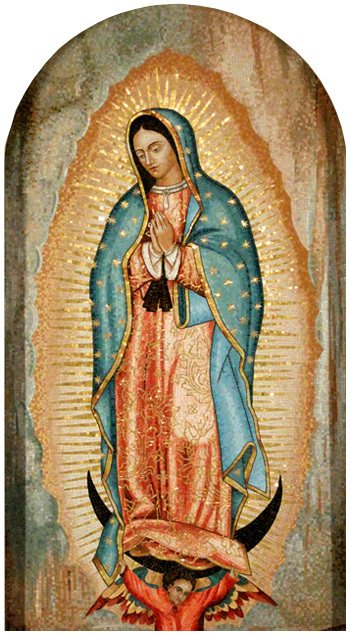 When she came home and had the film developed, she was astonished to find a brilliant image of Our Lady of Guadalupe superimposed on the shrine rather than the mosaic image she photographed. When neither she nor professional photographers she consulted could give a reasonable explanation, she took it as a sign that she should make it her mission to promote devotion to the Blessed Mother under the title of Our Lady of Guadalupe, the Patroness of the Americas. That the Our Lady of Guadalupe image is generally perceived as depicting Mary pregnant with Jesus was not lost on Sister Paula, who was staunchly pro-life. Her inner voice told her she, like Juan Diego to whom Our Lady appeared in 1531, should have a shrine erected to Our Lady. Like Juan Diego, she was hesitant to act on it at first. It wasn’t until Pentecost Sunday, 2010, as she was walking down Broad Street after Mass, that her voice told her this was where it should be. That happened to be right in front of the Carto Funeral Home. She approached Nunzio Carto, whose establishment it was, and explained her mission. He enthusiastically agreed. That was almost four years ago. Sister Paula approached her many friends who were backers of the American Academy of Sacred Art to help plan the shrine. She also engaged an ecclesiastical sculptor to design and craft the shrine. Everything takes time, and although Sister Paula did not live to see it to completion, her friends are determined to see it through. “Sister Paula would be thrilled,” said her sister, Paula Luskus (whose name Sister Paula adopted when she entered the convent). The family was from upstate Pennsylvania and she originally considered the Carmelites, but their local bishop convinced her that her talents would be better used in the world, rather than a cloister, her sister explained. It was only after 17 years as a classroom teacher that she got back to art, which was her special talent. Steven Kilpatrick, the Cherry Hill, N.J., sculptor personally selected by Sister Paula, has executed sacred art for churches and shrines around the country and as well as Europe, South America and Africa. “I knew her well; she was an exemplar and a brilliant artist and I considered her saintly,” he said. To create the model for the sculpture Kilpatrick has obtained a high-resolution digital image of Juan Diego’s tilma. The statue itself, first formed in clay, will be cast in molten bronze through the ancient method of lost wax, with a modern touch: the use of colors in the bronze. “It will be exactly as seen on the tilma,” he said. Since Sister Paula’s encounter with Nunzio Carto, he has stepped down from active management of the funeral home, but his family intends to honor the commitment he made to Sister Paula. “This is something my father-in-law wanted to do; he is a good man,” said James Guccio, speaking for the funeral home. would you please make some 12 inches size of Our Lady of Guadalupe using the same method you are using to make the one for Broad Street. thank you and God bless you. However, I hope that the Shrine can be moved to Church owned property if the funeral home ever closes or loses their love & respect for the Shrine. I am elated to learn about this project. Please let me know where to send my small contribution. Thank you Blessed Mother of the Sorrowful Heart. This is terrific. I know Sister Paula is well pleased with the work. I will try to help wherever I can. I say a Hail Mary to Sister Paula every day. I had mailed her a copy of my son-in-law’s grandmother with her Irish poetry on the back. She sent it back to me saying it belongs in the family.